Miroslav Philharmonik running in Cakewalk Sonar 5 Producer Edition. Note the keyboard display showing off key split zones. Miroslav Vitous's orchestral library was the first of its kind, and more than a decade after its launch, has been reinvented as a self-contained virtual instrument. Is the original still the best? Miroslav Vitous — composer, virtuoso bassist and founding member of Weather Report — can probably be credited with inventing the idea of a sample library that covers every instrument in the orchestra. Wanting just such a collection for his own use, he found nothing that would do the trick, and in 1993, started doing the job himself. State-of-the-art recording and digitising technology was used: initial sessions were recorded at 20-bit, with 24-bit technology used later in the process. The players of the Czech Philharmonic Orchestra — solo or ensemble, playing with various articulations and expressions — were recorded on stage in Prague's Dvorák Symphony Hall, sitting where they would normally appear in most orchestral situations. The resulting stereo samples required no further panning: instrumental groups added to a mix instantly fit, naturally filling up the stereo field, with the concert hall's ambience adding to the illusion. Despite being huge and expensive, the collection became the mainstay of many media composers, and was eventually released for Roland and Emu samplers as well as the original Akai. Rather later, it was also converted to Giga format for Nemesys/Tascam's software sampler. Now, however, the trend is for sample libraries to be built into plug-ins, and so the next step on the road for the Miroslav Vitous library is Miroslav Philharmonik, driven by the same plug-in technology that also powers IK Multimedia's Sampletank 2 and Sonik Synth 2. Sonik Synth 2 was created in partnership with Sonic Reality, and it's SR who have developed Miroslav Philharmonik from the original sessions, including material not previously released. The resulting plug-in crams 7GB of sample data, totalling more than 1300 instruments, onto two DVDs (the plug-in installer is on its own CD). And the best part? The plug-in costs a fraction of the price of the original library. Strings, brass and woodwind instruments form the core of the collection, along with a full range of orchestral percussion (tuned and untuned), male and female choirs, pipe organ, Steinway piano, concert harp, classical guitar and harpsichord and even ambient noises — page rustling, musician chat and tuning up noodles. 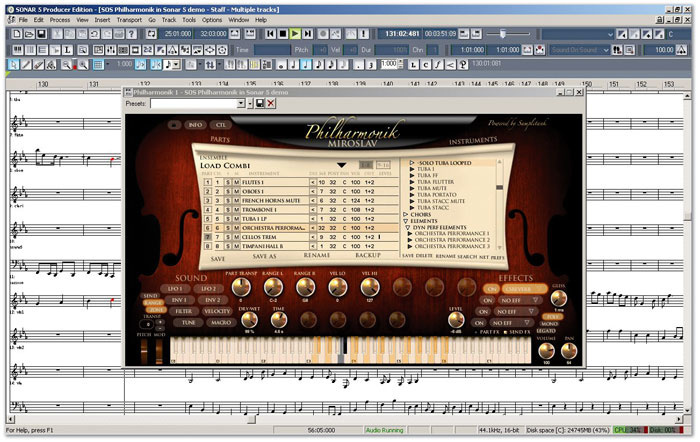 With Philharmonik, you can simulate the complete orchestral experience. The Philharmonik box contains everything, including a full printed manual and a poster illustrating instrumental ranges and where on the stage of the Dvorák Hall the musicians were placed during recording. One document that isn't provided in print is the detailed sound manual. But this isn't surprising: comparing IKM's pre-release publicity (and even the user manual) with the final product seems to indicate that Philharmonik is equipped with a lot more instruments than were initially planned. The timely PDF on the installation CD reflects this, although it doesn't list every patch: you're provided with the data — stylistic abbreviations and Instrument types — to work out what a given patch will sound like. Being based on tried and tested Sampletank technology, it's no surprises that Miroslav Philharmonik is instantly compatible with any software that supports VST, RTAS, DXi and Audio Units under Mac OS X or Windows 2000/XP. Such comprehensiveness might seem obvious, but not every commercial plug-in developer has grasped the concept. However, there's currently no stand-alone mode. This option is almost essential for anyone wishing to use the plug-in as an audio proof source with a scoring package (few have the audio and plug-in hosting capabilities of full-blown sequencers), or for those of use who wish to offload plug-ins to a separate computer. IK say that stand-alone operation is coming to the Sampletank 2 family soon. A close-up of the Instrument browser, showing some main groups and various subfolders. The black arrow indicates a parent patch with one or more child patches derived from it. You'll have a feel for what instruments are provided in Philharmonik by reading through the main review. But to make sure you're aware of the full range of instruments sampled, including some of the relative rarities, here's a list. There are actually more 'Instruments' (ie. Philharmonik patches) than listed here, because of the inclusion of variations such as solo, ensemble and different articulations. Strings: violin, viola, cello, double bass. Woodwind: piccolo, flute, alto flute, bass flute, oboe, English horn, B-flat clarinet, bass clarinet, bassoon, contrabassoon. Brass: trumpet, flugelhorn, French horn, tenor trombone, bass trombone, tuba. Tuned percussion: glockenspiel, celeste, vibraphone, marimba, crotals, cowbell, tubular bells, plate bells, gong, timpani. Untuned percussion: agogos, bass drum, bell, bongos, castanets, chimes, cymbals, claps, metal plates, shakers, snare, tambourine, triangle, woodstocks. Choir: female, male, split, mixed. Others: harp, guitar, organ, piano, harpsichord, ambient noise. In addition, various 'articulations' are provided, though not all apply to all Instruments (there wouldn't be much point in flutter-tongueing a violin or trying to play a marimba pizzicato): crescendo, détaché, expressivo, flutter, glissando, legato, marcato, mute, pizzicato, portato, spiccato, staccato, sul ponte, tremolo and vibrato. Further variety comes with examples that are have faster or slower attacks and release times and are darker or brighter than the main Instruments. Mix and match until you get past 1300 patches! Both the look and user interface of Philharmonik feel like Sampletank 2, only this time with an attractive wood-effect hand-carved look, with scrolling and filligrees. Behind the wood display runs the ST2 engine offering 16-part multitimbrality (visible in two banks of eight parts), 256-note polyphony, full MIDI control and IKM's latest pitch-handling and time-stretching algorithms. The central display is also largely identical, bar colour scheme and a slight rearrangement of the file and search buttons. This ground has been covered in SOS before, but to briefly summarise, each of the 16 parts in Philharmonik is equipped with the same set of parameters. The 'Instrument' assigned to a part has its own slot, and your choice is made using the hierarchical instrument selector to the right. Any parts set to the same MIDI channel are layered; dig deeper and you'll find parameters that let you split or layer parts for true 'combination' creation. There are dozens of combis in the factory collection that put whole orchestras, sections and specialised soloists (complete with switchable performance effects) at your fingertips; sensible use of key ranges and velocity-switched layers makes these examples very playable and surprisingly authentic-sounding. You're free to constrain the polyphony required by any part; the default is 32 voices, but managing polyphony (ie. keeping it as low as possible) can help the CPU load of the plug-in. One-voice polyphony doesn't always work well, though, even considering we're dealing with an orchestra-full of largely monophonic instruments. Taking advantage of natural decays, glissando effects and so on requires two or more voices to produce convincing results. Solo, mute, level and pan controls make up the basic mixing parameter set, and audio can be routed to one of 16 stereo busses, providing your host software (or audio hardware) can handle this much audio streaming. There's also a little output-level meter, with further part feedback provided by part numbers flashing in response to incoming MIDI data and a column indicating the size (in MB) of the currently loaded instrument. If it says '0', don't panic: the assigned instrument uses less than 1MB of sample data. Each part is equipped with four auxiliary sends, each switchable post/pre the level control, and a part can access up to four insert effects, as discussed in the 'Effects In Philharmonik ' box. If you think 16 parts each running four effects, plus send effects on top, sounds like a recipe for CPU overload, it is. So use the insert effects sparingly if your computer seems to be struggling. And be sensible: reverb, for example, should suit nearly every situation if accessed as a send effect rather than inserted in each part individually. As sample libraries grow, so they become harder to summarise in any sensible manner. I mean, this library has over 1300 basic Instruments (patches or presets, if you like). Add the factory Combinations and that's a lot of potential material to sift through. Luckily, IKM have provided the plug-in with sensible organisation. 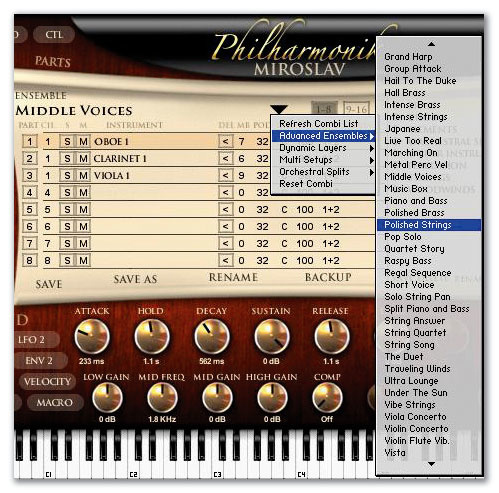 Open the plug-in, and you'll see the top level of Miroslav Philharmonik 's hierarchy in the browser window: there are folders labelled brass, strings, woodwinds, percussion, choirs, elements and orchestral elements. Some of those headings will be self-explanatory, others initially less so. For example, open 'other instruments' if you'd like to audition classical guitar, harp, cathedral organ, harpsichord and piano patches. All major instruments, and some minor ones, of all orchestral instrument groups are represented (check out the ' Miroslav Philharmonik Instruments' box for the full list). I was pleasantly surprised to find contrabassoon, bass clarinet, alto flute, bass flute, flugelhorn and an unexpectedly wide range of percussion in the library — not for Miroslav just bass, snare, timpani and crash cymbals. The full useable range of nearly every instrument is covered, so the lowest note the real instrument can produce is the lowest note you can use to trigger the instrument from a keyboard. Upper ranges are also capped to keep tyros within the boundaries of what is possible in the real world. 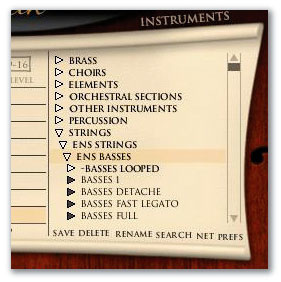 A section of the enormous Combination list: many examples are virtual orchestras or whole sections playable from the keyboard.As you'll hear if you listen closely, a sample hasn't been created for every note in every multisample. But you'll have to listen closely: the initial samples were made sensitively and the subsequent keygrouping usually doesn't sabotage that work. And for Instrument types where one sample serving a large keygroup would become really obvious (tremolo strings, for example), more samples arranged in smaller keygroups make up the multisample. The more obscure folders in the browser hide some rather interesting collections. First of all, the 'elements' folder provides patches that are aimed at getting the best out of performance-style combinations. For example, the dynamic performance elements are quite complex 'Instruments' that would normally be created in a Combi. Their role is to take up fewer parts and less polyphony in a combi, offering a faster way to a fuller sound. At the other end of the spectrum are the 'mono elements'. Here, a 'best of' collection selected from the main library is provided in mono format, again mainly for use in Combis (they take up less RAM and polyphony and can be panned at will). As a bonus, they still sound great and can be used for normal multitimbral sequencing if desired. I find the mono elements Instruments to be particularly welcome when quickly scoring for small virtual chamber ensembles. Many solo instruments in this set are ideal for just this application. There are several other families of patch that are primarily aimed at keeping the CPU load down during Combi creation, but which work fine in any situation. Special ranges elements offer low- and high-range maps of samples for plonking within specific Combi key ranges. The orchestral sections group, divided into string sections, mixed orchestra and brass/wind sections, provides rich full sound and sonic variety in individual patches. Other elements collections include the orchestral player noises — coughs, page turns, talking and general hubbub. Last of all, the percussion elements provide individual percussion instruments mapped across the whole keyboard, allowing you to add a particular sound anywhere in the key range within a combi. More percussive variety comes in the form of percussion menu maps, in which different 'articulations' of a single drum are mapped across consecutive keys — different batter and attack types for the bass drum, for example. The Sampletank 2 engine that drives Philharmonik means that the new plug-in's 50+ parameter set is strongly biased towards subtractive analogue synthesis. These parameters let you stretch your plug-in a little further than you might generally want in an orchestral context, but you don't have to use them. However, applying these pure synthesis parameters to such a musically involved collection of samples does often result in synthetic sounds that have a similarly organic feel. In common with other ST2-based software, the parameters are divided into several pages of up to eight parameters each. The upper row of knobs in the lower part of the window do the dirty work, with the pages selected by the 'Sound' menu buttons to the left. The menus are LFO 1 and 2, Envelope 1 and 2, Filter, Velocity, Tune and Perform, which is the Sampletank standby Macro. The latter are IKM-defined real-time sonic tweaking parameters; there are up to four per patch and they can be, like nearly every other parameter on board, assigned to external MIDI controllers. The two LFOs are largely identical, with a good range of waveforms and a tempo-sync option; LFO 1 adds delay and free-running options and can be routed to level, pitch or the filter. LFO 2 has the same targets, plus pan. A 'hold' parameter is placed after the attack portion of the otherwise standard ADSR envelopes; Env 1 is routed to level, though, while Env can be routed to either or both filter and pitch. The filter is simple but effective: low-pass, high-pass or band-pass at 6, 12 or 24 dB/octave, with cutoff and resonance controls. Velocity response is well specified: a choice of input curves governs how your playing affects level, filter, pitch, resonance, LFO1 depth and/or envelope 2 sustain. Like these subtractive synth elements, not all of the pitch-manipulation technology accessed in the Tune menu is relevant to an orchestral sound set. For basic coarse or fine tuning and setting pitch-bend wheel response, the Resampling mode, which just plays back samples as normal, is appropriate. It also offers, rather incongruously, a pan control, for the 'zone' option we'll encounter in a moment. The Pitch-shift/Time-stretch option is best suited to looped rhythmic material, none of which is included here, but the Stretch resampling option is worth knowing about, as it allows the sample assigned to a keygroup to sound more natural when played above or below its central pitch, and when pitch-bent. Keygroup transitions can still be apparent, but the pitch-shifting artifacts you might normally hear are not so obvious. There are a couple of other menu options, but these take us away from synthesis and towards the Combination. 'Range' assists in the creation of complex layers and splits, using patches assigned to up to 16 parts to create a monster Combination. A part transpose option lets you put the instruments you want in the key range you want and still have a musically useful pitch range. Whether the combi is multitimbral or a massive layer, you can save the final result. A little extra sonic flexibility is provided by the Zone menu. Firstly, selecting this menu offers graphic feedback (through Philharmonik 's mini keyboard) of how samples within an instrument's multisample set are assigned. But selecting a keygroup/zone when it's viewed in this manner allows you to modify synth parameters for just that zone. The original patches are unchanged, with any tweaks made here saved in a Combi. Within the main orchestral instrument sections, you'll find ensemble and solo folders (except for instruments, such as the tuba or bass clarinet, which don't tend to get used in ensembles), and as you move down the hierarchy, you'll find the performance variations — different articulations and dynamics and so on. Thus, string instruments have pizzicato, sul ponte, tremolo and détaché options, while brass and woodwinds have staccato, flutter tongueing and so on. Special effects such as string glissandi, timpani slides and so on are also part of the brew. Some of the sonic variations — dark, bright, slow or fast attacks — use different sample sets, while others are created through filtering, EQ and enveloping, though the results still usually sound quite natural. Other variants are optimised for real-time control, programmed to work with breath-controller data, aftertouch or expression pedal, for example. A couple of options use the Sampletank 'Stretch' engine to tidy up the transitions between keygroups. Philharmonik 's patch organisation follows that of other ST2 products. The user can't choose a multisample to work on from scratch, but an existing patch can be freely edited. It then becomes a 'child' preset of the original factory 'parent'. There are plenty of factory children, too, which can also be edited and saved. One thing that becomes almost immediately apparent is that the main Instruments feature unlooped samples. This is obviously the case for staccato and pizzicato samples, but other performance styles feature sample lengths that are often defined by a lungful of air or a single bow stroke. For most applications, this will be long enough, and you have the advantage of hearing what a player can add as the note plays through. Subtle changes in timbre and vibrato and other examples of an individual's taste and style have been captured. Together with the faithfully reproduced attacks (if an instrument speaks slowly, so does its Miroslav equivalent), the result is often an uncanny representation of the instruments sampled. But if you find you need longer notes, there are looped versions of nearly every Instrument on board (percussion are some of the obvious exceptions). Not only do the looped Instruments use less RAM, but their sound is identical to the unlooped varieties — unless you're after the subtle, deeper 'feel' of the longer samples. All samples, looped and unlooped, benefit from the natural attacks, throatiness, breaths, bow noise and the like. I would tend to go unlooped for smaller ensembles, changing to looped if my RAM or CPU was beginning to complain. Whichever version you use, constant auditioning is to be encouraged, both to help your familiarisation with the library and to help find the right Instrument for the current context. A neat side-effect of the detailed sampling, and authentic attacks, is that your playing will change to suit the sound being auditioned — it's part of the magic of Miroslav! 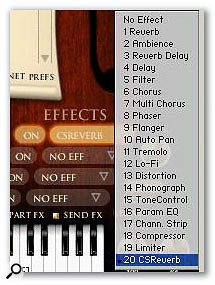 Philharmonik's 20-strong effect list — check out lo-fi and phonograph if you want to add that 78rpm feel to your 21st Century productions!Effects processing is probably more obviously useful than subtractive synthesis components in an orchestral plug-in, but IKM's implementation can initially seem rather odd. There are 20 effects on board, and each part has access to up to four inserts, one of which is always EQ/compression; these insert effects are saved with a patch, but can also be modified as part of a Combi. Four further slots are available as auxiliary send/return effects, accessible by all parts. It's a shame that there are no 'insert' effects on the main stereo mix, though. IKM try to tell us that the effects available are 'classic', implying, I think, that they suit the classical environment. Hmmm... Five delay and reverb/ambience choices are crowned by the CSReverb, a deceptively simple three-parameter effect that's derive from IKM's forthcoming studio reverb plug-in. On this evidence, that reverb is going to be worth a listen. While nearly all Philharmonik Instruments sound vibrant dry, mixes sparkle even more with a little of this reverb. IKM obviously think so, too, since it's provided as a default process whenever you start up the plug-in: you need to switch it off if you want to start properly from scratch. Modulation effects — chorus, multi-chorus, phaser, flanger, auto-pan, tremolo — make up a big group and then come the creative effects. Lo-fi, distortion, and phonograph seem a little out of place, given that most users will have similar effects elsewhere if they need them. Welcome bread-and-butter processing comes in the shape of tone control, parametric EQ, channel strip, compressor and limiter. The breadth of this set means highlights are hard to pick out. Even lowlights are relative: I found I didn't take to the choir collection as a group. I can hear that some great recording, editing and collation has gone on, and that attention has been paid to decent SATB vocal ranges, but the result is still a little too artificial, especially for fully exposed work. The organ, on the other hand, is magnificent. I haven't that much use for one personally but it does sound and play fantastic. It can also add even more weight to an arrangement if the context can handle it. And there is delicacy, in the portative organ-like 'Cathedral Organ Flutes', and subtle depth in the fundamentally bass-heavy 'Bass Pedals'. Amongst the other unexpected instruments, I liked the piano and harpsichord, though the latter is a little too 'baroque' and big-sounding for most of my needs. The classical guitars are quite natural-sounding (some genuine finger noise helps), and the harp set includes a nice range of arpeggios and open tones plus straightforward notes. In the MIDI Control pop-up, any parameter can be assigned to an external MIDI controller.Within the orchestra proper the main low points, for me, are amongst the solo strings. Violins seemed initially to be unconvincing, but one of IKM's audio demos inspired me to persevere and it's worth the effort. It's not perfect, but the vibrancy that's typical of the whole collection helps it win through in most situations, even fully exposed. You know it's not real, but it's not unpleasantly unreal as the average workstation synth violin might be. Violas have an exaggerated scratchiness that is often attractive but can make it difficult to create a balanced arrangement. I have no complaints at all about the cello collection — true ear candy, with full body right down to the open C. Double basses have some of this weight and presence but work better in ensemble presets. In fact, the ensemble strings — for each section and en masse — are uniformly musical and rich, even the section violins. The selection of articulations — spiccato, pizzicato, sul ponte, tremolo and so on — is perhaps not as wide as in some more recent and expensive sets, but it will be more than enough to achieve what most of us are after. Brass and woodwind keep the candy shop open: horns are a slight muddy low point, but there are solo and ensemble examples that blend well in many contexts. The tuba is a big surprise — one seldom hears such attention paid to this instrument in a sample-library context. There are perhaps not quite enough samples for the solo trumpets (and flugelhorn), but the results are still nicely brassy, with useful mellow and bright variations. There are some obvious jumps between keygroups in the lower register of trombone and bass trombone, but one can imagine different slide positions being the cause. Many other instruments have 'special performances', such as glissandi: why not the trombones? Bassoons are fab — really rich and woody — and the contrabassoon is accurately captured (it doubles nicely with tuba or cello). Sampled flute can be disappointing in my experience, so it was a pleasant surprise to hear patches in Miroslav Philharmonik that actually sound like a flautist — and one who enjoys playing. I'll remark again on the presence of alto and bass flutes, and they've been treated just as well as the main C flute. Clarinets have nicely balanced lower, middle and upper ranges — a pleasure to play — and oboes are amongst the best I've heard. The bass clarinet is a little disappointing, but I'm still really glad to have access to it. Percussion takes a little getting used to, but there are some weighty bass drums and snappy snares that work very well; all the little extras (chimes, castanets and so on) have real clarity and depth, and they play well, too. Although I'd have liked an E-flat clarinet and an orchestrally focused sax or two, I can't complain about the variety of this collection, especially for the money. Philharmonik has been constantly linked to my sequencing software since the start of this review — I like mixing up 'real' orchestral sounds with other bits I'm working on, and find it the perfect 'audio proof' when scoring or composing. Rather than the often stilted result one would hear with even a good General MIDI sound source or workstation synth, MP becomes a part of the process. Rather than inputting notes, you're actually playing the sounds. The flip side of this situation is that existing MIDI data created with a different sound source in mind may not sound right, at least initially. You may have to spend a little time searching through Philharmonik 's presets to find voices that work, and then still be prepared to fine-tune the MIDI data or the preset to produce the desired performance. Gripes and problems are negligible. First of all, it stands to reason that the more RAM and CPU power you can throw at MP, the better. On a day-to-day level, I found that two Instruments would sometimes be required to perform one part, since no single Instrument had the right mix of playing techniques. Sampletank technology doesn't really take advantage of program changes or other easy ways to swap presets, but there are 'elements' patches that often have a little more flexibility. The other option is to use more than one part to create an effect. Occasionally I felt there weren't quite enough samples to a multisample, and I found one odd instance of the pitch-bend control responding back to front, on just a few higher notes of a 'Stretched' cello preset. On the other hand, Stretch helps a number of patches make the most of the keygroups supplied. Philharmonik isn't alone in the market — not even the sub-£500 market — but its pedigree gives it an edge, even though some raw material is over a decade old. The samples at the heart of Miroslav Philharmonik represented something of a high-tide mark in sample-library history. They broke new ground in terms of detail, recording quality and expressiveness. With the release of this plug-in, the set becomes the serious orchestral library for the rest of us. That we have it all, and more, in a ready-to-go plug in for under 400 quid, a fraction of the library's original cost, is amazing. Supports all major plug-in standards, Mac or PC. Demands a lot of its host computer. Keygrouping occasionally not detailed enough in exposed passages. Extraordinary value for a collection of some of the most playable, well-recorded samples around. I can't stop using it! IK Multimedia UK +44 (0)1223 234414.